Rizzo Packaging is a leading supplier of custom rigid setup boxes for the confectionary, greeting card, stationary, game, toy, award, promotional, gift, healthcare, pharmaceutical, cosmetic, jewelry and industrial industries. Along with setup boxes, we also offer custom clear vinyl PVC box options. A setup box or rigid paperboard box is made of heavier weight paperboard, permanently glued together with paper stays and wrapped in printed or colored paper. Unlike folding cartons, these are assembled at the point of manufacture and transported already "set-up". Set-up boxes are typically used for protecting high value items or to create a higher perceived value. Also, because they come pre “setup” there is no tooling or added labor to form the box or tray. Setup boxes offer a great solution for packaging a wide range of confectionary items. Most often used in chocolate or truffle boxes, setup boxes offer great protection with an elegant looks and feel. Setup boxes are an easy and cost effective way to customize your box with printed logos, foils or embossing. Many large and small greeting card and stationary companies often turn to setup boxes because of the benefits they offer. Setup boxes are sturdy, easy for fulfillment while maintaining an elegant look and feel. Traditionally used in the game and toy industry setup boxes have been a main stay in the industry. For any product that will need a box to be opened and closed repeatedly over time a rigid setup box is a great choice. Setup boxes are often used for award and promotional packaging. Setup boxes are cost effective to customize which makes them the preferred choice to allow the package to create a distinctive look and help differentiate the product in the market. Setup boxes offer a distinctively elegant look and feel that is often desired in gift boxes. Setup boxes paired with foam or die cut inserts are a great option to protect fragile or temperature sensitive products and materials. 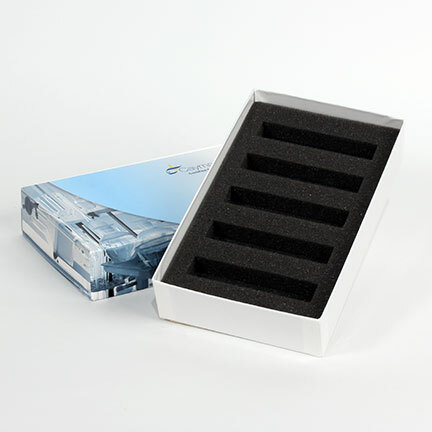 Setup boxes offer distinctively elegant look and feel that is often desired in Cosmetic industries. Setup boxes offer a distinctively elegant look and feel that is often desired in jewelry packaging. Setup boxes come pre-set up and need no other tooling, machining or labor to setup the boxes. This makes them a great choice to be used in manufacturing as a tray, box for parts, or printed material on production lines. We offer a full line of clear vinyl PVC lid and tray options. Often used in greeting card and confection packaging a PVC vinyl lid or lid & base combination will allow for full visibility of the product without opening the box. This would be the best choice where the products sell themselves.